Life begets life. Energy begets energy. Energy highs and lows are the norm for humans. But for those people operating with autoimmune diseases, it can feel as if the dial is constantly turned to low. Prior to my celiac diagnosis, energy was a difficult thing to muster. Most afternoons were spent sleeping for hours at a time, with intense headaches, stomach and joint pains, numbed by some form of painkiller. Exercise was an intense chore which left me feeling more broken rather than more energy-filled. I read a book recently which made a big impact. It was one of those impulse airport bookshop grabs just prior to a flight that you can't imagine never having read. 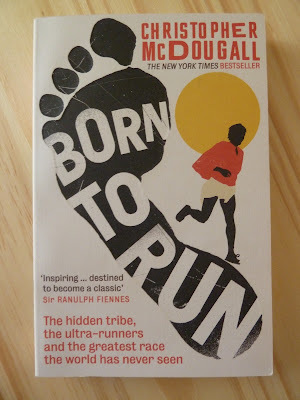 It's called: Born to Run by Christopher McDougall. Filled with epic adventure and pure inspiration, the book brings across the thrill of rediscovering what it should be like for every human who has the physical capacity for movement to run (and actually enjoy it...injury free). Minimalist running or barefoot running is another strong topic of debate in the book, which for anyone who has ever had an injury caused by running is something which might peak your interest. Inspired by the Tarahumara Indians of Mexico's Copper Canyons, whose culture is built around running long distances in remote locations wearing leather sandals, the book also delves into the scientific aspects of running and running shoes. For instance, have all the advances in running shoe technology really led to injury-free running? For many people with expensive running shoes that control pronation, give arch support and have enough cushioning for your heel striking gait to feel like you're running on clouds (but who still sit with shin splints or foot fractures), the answer is a resounding: "NO!" I've been pondering this for a few months now, using myself as a guinea pig of sorts. Over the years of starting and stopping running, most often due to shin or knee complaints; upping the weekly mileage has mostly been in new running shoes. You know, the ones you pay a whole lot of money for to prevent those injuries. Well, for the past couple of months or so of running, I've been using old running shoes. The ones you're supposed to retire on the advice of running magazines because their cushioning isn't so great anymore, and the support has worn down. You know, the ones that are now supposed to be causing you injuries. Not a knee or shin complaint in sight. The premise of minimalist running is simple. 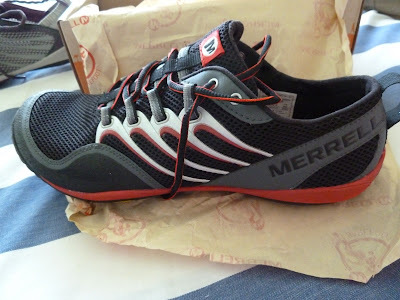 Take away the running shoes designed to alter your foot's natural way of hitting the ground during motion, bring back the feedback your foot should be getting from the ground which allows you to land more carefully, and what you get is a stronger foot and an adapted natural shock absorption system (i.e. your legs) that eventually self-corrects posture and alignment, allowing you to run injury free. The way a child would run barefoot across a field out of sheer joy. It's an interesting premise, I think. 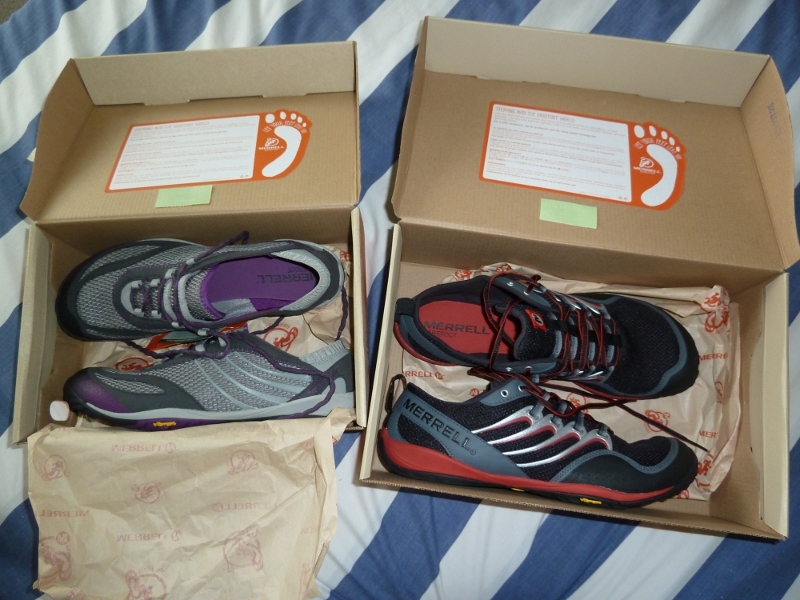 So buoyed by months of running happily in old shoes, and a sale on at the Cape Union Mart, Simeon and I came home yesterday excitedly clutching our Merrell barefoot collection shoes. Now before you scoff, since barefoot running should indeed be free and shoeless, would you relish your foot being cut up by a rusty aluminium can or smeared in dog poop? Me neither. Thus, barefoot shoes a la Vibram five fingers or the like. Notice the differences in design from a regular running shoe in terms of slope and cushioning? Donning our shoes for the first time, we set out on our evening run marvelling at how much of the ground we suddenly felt and how differently our feet were landing to adjust to that fact. It was the first time while running through the veld that I didn't almost twist my ankle, and I realised it was because I was stepping more carefully over the rocky paths because I could feel the ground! Another interesting fact is how much lighter the shoes are versus regular running shoes. Your feet literally feel less heavy to pick up. We'll be interspersing the use of these shoes with our old running shoes, allowing our feet/calves/legs/posture time to adapt gracefully to the landing modifications required. For as Benjamin Franklin said: Energy and persistance alter all things. And in closing, for those of your who have ever not felt quite right after eating a meal (or, let's face it, just felt anywhere close to crappy for days on end after eating certain foods), please do your self a favour and get tested for allergies. Your life will thank you! This is really interesting stuff! I have been trying to get into running for ages now. I went for a shoe assessment at Sports Science, and they told me my feet pronate. I therefore had to buy shoes to alter this, but these have led to me always either getting shin splints, sore calves or worse, aching feet! I am going to look for these barefoot shoes you've written about and give them a go. Thank you! So glad it could be useful to you, Linda! Good luck. Thank you, Ramona! Fast walking is wonderful exercise...and people tend to stay injury-free but fit doing it too, which is what's important when exercising. 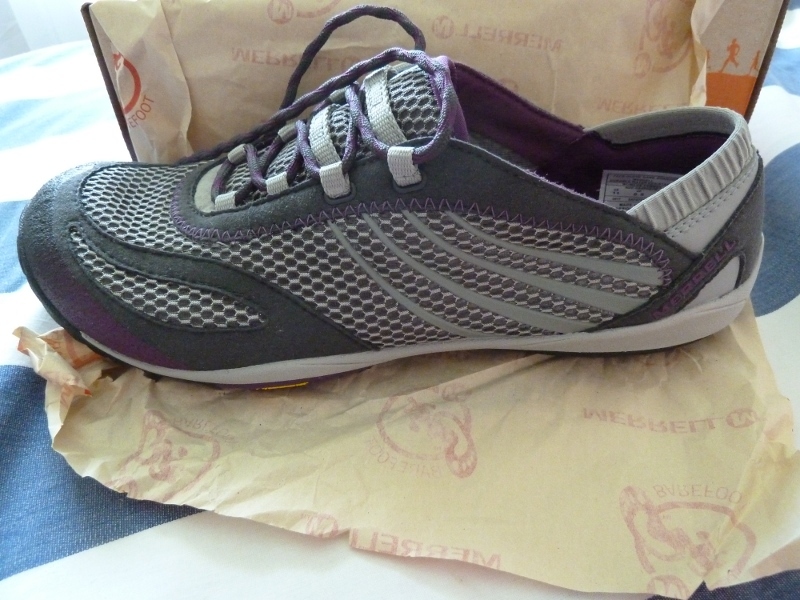 I'm not a runner, but I LOVE my Vibram Five Fingers. I live it them (when it's warm enough of course). And the best thing for you is always what is closest to nature - food, clothing, everything. Keep it as natural as possible. Hope you're out enjoying your summer. PS - I love my merrills too - comfy! I couldn't agree with you more about keeping things as natural as possible. Thanks so much for your kindness and condolences.